We have just a few swimmingholes so far for this state so these are presented without a state map at this time. 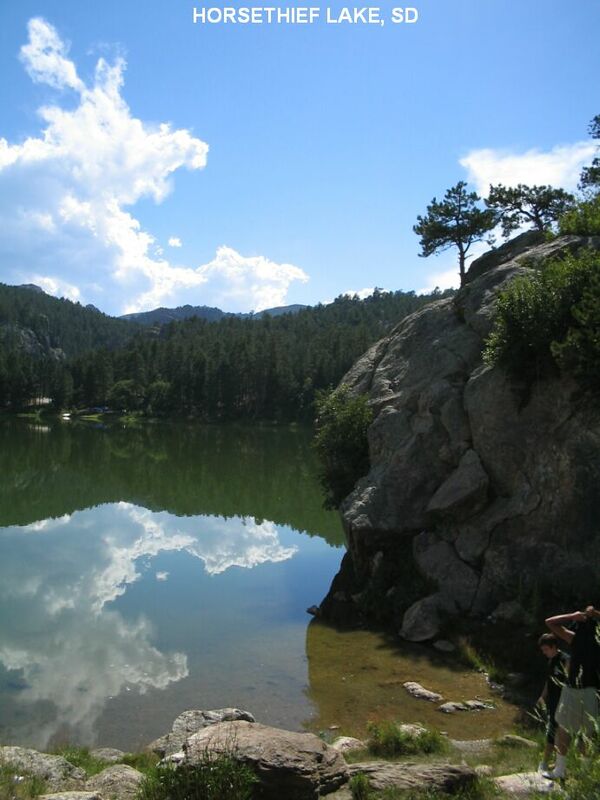 Swimming holes in Rapid City and nearby. See DIRECTIONS below for details. Several N. F. campgrounds west of Rapid City off RT 385. EVANS PLUNGE [EVAN]: Indoor (commercial - with fee) naturally-warm (87 degrees) mineral water pool with hot tub and slides. The springs continue to flow up through the pebble bottom of the site’s pool. At the flow rate of nearly 5,000 gallons per minute, Evans Plunge is never the same water, changing entirely every half hour, ensuring fresh clean water at all times. The mammoth spring at the north end of the pool is the original spring that Native Americans used for drinking water and year-round source for bathing, believing it had the power to heal. WEB SITE . Address: 1145 North River Street, Hot Springs, SD 57747 Phone: 605-745-5165. LAT, LON :lat= 43.44143, lon=-103.48053(source: Map) (accuracy: Approximate). LINK TO GOOGLE MAP. Very confident. Not verified. Updated 1/2014. CASCADE FALLS [CASC]: Swimming place at bottom of falls fed by natural spring (always 67 degrees) at a National Forest picnic area. Clean, clear, warm water. Parking lot, restroom, picnic tables, path to falls. WATCH OUT FOR POISON IVY. From the town of Hot Springs, go south on RT 71 (Cascade Rd.) for 8 miles to signs for Cascade Falls Picnic Area. LAT, LON :lat= 43.31878, lon=-103.5620(source: Map) (accuracy: Approximate). LINK TO GOOGLE MAP. Very confident. Not verified. Updated 1/2014. Swimming holes near Mt. Rushmore and the town of Keystone. See DIRECTIONS below for details. 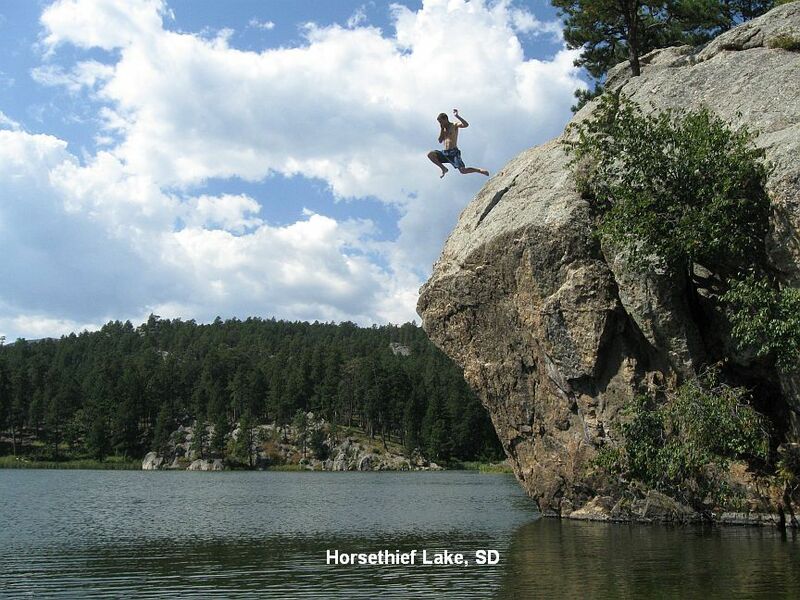 HORSETHIEF LAKE [HORS]: Just down the road from Mt. Rushmore, this is a great place for a 30 - 60 foot cliff jump into water that is said to be plenty deep. PHOTO , PHOTO . Here is a report from a visitor in 2009: "You can walk in from the road. It gets gradually deeper for about 10 feet and then just drops straight down to the 15 feet level quickly. To get up the rocks you can access them close to the road and climb up to the 30' elevation rather quickly. Then the 50 or 60 foot jump is just a walk up the same rock near a tree. The water is plenty deep enough." "We were out there a few weeks ago. Then some people stopped and drove head first into the water. Then they did a backflip. It was a great time. Here are some better pictures to post which gives a good idea on the height which was 30-50 feet depending on where you jumped from." From Keystone take RT 244 west (pass Mt. Rushmore) and go about 5 miles and the lake will be at the bottom of a hill on your left. When looking at the lake the jumping cliff is on the right. Parking is right next to the road in a pull off, and the lake is just over the guardrail, and its an easy climb to the top. LAT, LON : lat= 43.89408, lon=-103.48069(source: Map) (accuracy: Approximate). LINK TO GOOGLE MAP. Very confident. Not verified. Updated 1/2014. HIPPIE HOLE [HIPH]: (AKA "Big Falls") Huge pool at the bottom of Big Falls on Battle Creek. Very popular - some trash and glass - wear river shoes. Cliff to jump from. YOUTUBE (video shows very dangerous activity - not recommended). We have two sets of directions for this, the first way seems better. FIRST WAY: From Keystone go east on RT 40 (Madill St) through old Keystone and drive about 3 miles then turn north (left) on Rockerville Rd. and after another 3 miles turn east (right) onto (unknown name) road. Follow this road about 1.25 miles then turn south (right) and follow this road to the end (about 1 mile) at a parking area for Hippie Hole. LAT, LON (of parking): lat= 43.89642, lon=-103.3652(source: Map) (accuracy: Approximate). LINK TO GOOGLE MAP. Park and follow he trail down to Battle Creek (BEWARE of POISON IVY) then downstream to the waterfalls and swimming hole (walk is only about .25 miles each way). Pretty confident. Not verified. Updated 1/2014. Swimming opportunities in tailwater area of dam. BE VERY CAUTIOUS OF STRONG CURRENTS. From Rapid City, go east on I-90 to Exit 212 then north on RT 83 to Pierre. Near Pierre go west (left) on RT 34/14 a short way then north (right) on RT 1806 to the Oahe Downstream Recreation Area. Swimming places are here (no better directions). CHAPEL LANE [CHAP]: Reputed (not sure) swimming place in Rapid Creek on the west side of Canyon Lake. To get here from Rapid City, go west on RT 44 (Jackson Blvd.) past Canyon Lake on the left and Blessed Sacrament Church on the right then take the next left onto Chapel Lane. Immediately there is a bridge over Canyon Creek and the swimming place is to the west side (right) of this bridge in the creek. Not sure how you access this swimming place. Be respectful of private property. LAT, LON :lat=44.05954, lon=-103.2954(source: Map) (accuracy: Approximate). LINK TO GOOGLE MAP. Uncertain. Not verified. Updated 1/2014. STEAMBOAT ROCK [STER]: Swimming place in Boxelder Creek at a National Forest picnic area. From Rapid City, take W. Chicago St. and continue straight onto S. Canyon Rd. then onto Nemo Rd.. STay on Nemo Rd. as with twists and turns to signs for the Steamboat Rock Picnic Area (all told, this is about 17 twisty miles from Rapid City) LAT, LON :lat=44.15647, lon=-103.46529(source: Map) (accuracy: Approximate). LINK TO GOOGLE MAP. Pretty confident. Not verified. Updated 1/2014. Swimming opportunities creek in scenic canyon. Dont have specific locations, drive down canyon and look for places. Several campgrounds south of here in the National Forest. From Rapid City, go west on I-90 to Exit 12 at Spearfish. Take RT 14 (E. Jackson Blvd) into Spearfish then turn south (left) on Main St. to stay on RT 14. Then turn south (right) again to stay on scenic RT 14 (Spearfish Canyon Hwy.). You will soon be running alongside of Spearfish Creek in the Black Hills N. F.. There are several swimming holes along this road. No more specific directions.